When living on a budget, you are probably trying to reduce expenses in many areas of your budget. This is a guide about advice for stretching grocery budget. 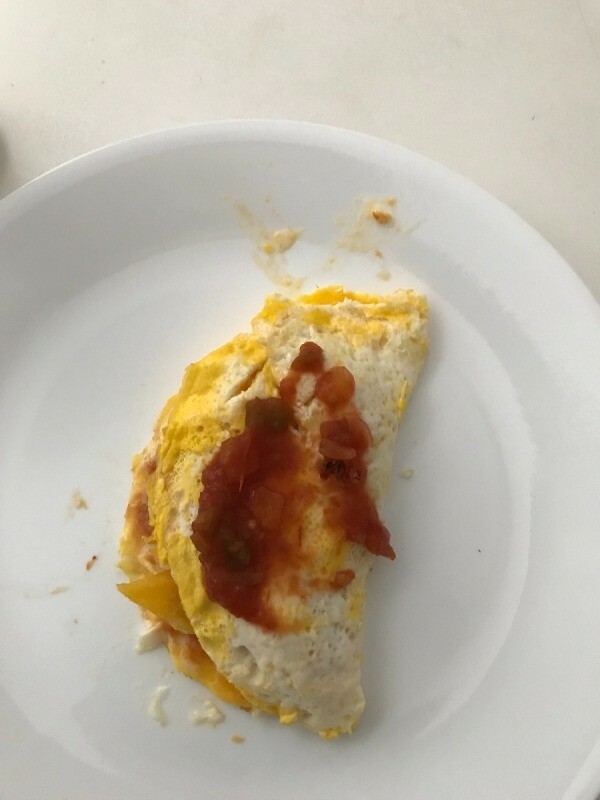 I love omelets, but never made a good one until yesterday. Every time tried to make one, I ended up with scrambled eggs. 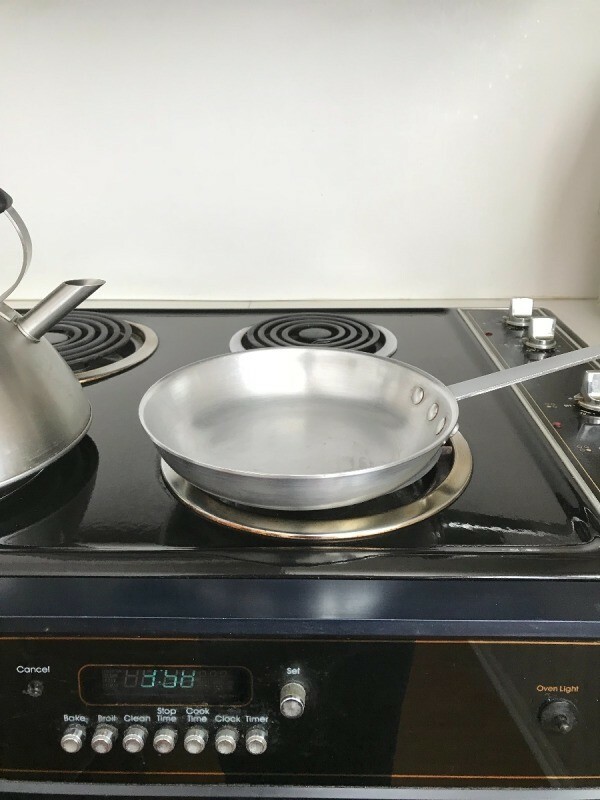 I belong to a cooking group, and they were talking about the best omelet pans. Apparently the pan is necessary, and I decided I wanted one, but thought the $99 recommended one was too expensive. So, yesterday I was at an estate sale, and I saw an omelet pan, so I bought it. 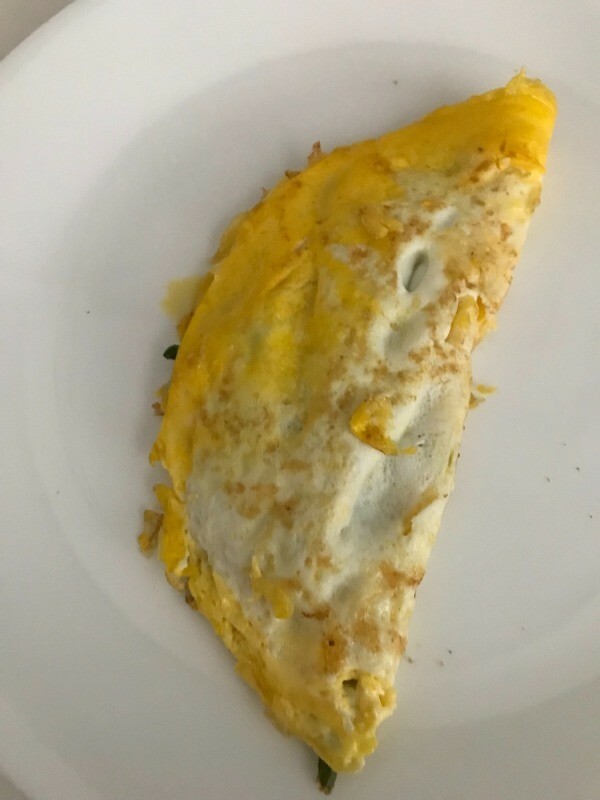 For the first time in my life, I succeeded in making an omelet. The pictures show asparagus and cheese and a Spanish one with peppers and salsa. I also have a picture of the pan. Eggs are an inexpensive way to get protein. The omelet will let you be creative and use up all your leftovers. They are quick and easy to make. You mix up the eggs and add them to a warm pan with melted butter or oil. After a minute or two, add any raw fillings to one half to let them cook. If the fillings are already cooked, wait until the next step. When the edges look cooked, add any cooked fillings to one side. Lift the other edge with a spatula and fold it over so it looks like a semicircle. Let it cook about a minute more, and slide it onto a plate. I paid $2 for my omelet pan. I used to always order omelets when I went to a diner, since I was convinced I could not make them at home. With coffee, the bill came to $10. No more! Where can I find help on food for the month, on a $350.00 budget? It's for my fiance and myself. That is 87.50 a week for 2. Not a bad budget if you follow the grocery store sales (I prefer grocery stores over Walmart), cut out the soft drinks, prepackaged food and use coupons (might can get some prepackaged snacks w/coupons). I follow a thrifty group if interested let me know-they post online where the deals are like what CVS is offering for the week and how you can combine certain coupons to get cheap or almost free and where these coupons are. This is great for shampoo, detergent, can goods and such. They also post freebies and combined items. Some ideas are cook dried beans from scratch and bag them in sandwich bags or snack bags then add these every chance you get to your meals like for instance chilli can really be stretched with cheap beans. Add chilli seasoning, paprika & garlic powder to a sandwich baggie full and mash around-makes a wonderful sandwich spread or a dip. Eggs-1 dozen can can several meal ideas. What ever you have left over from dinner - do not throw away-even a tablespoon can be saved! combine with a little cheese & wrap in a flour tortillia shell-freeze this and you will save enough for a meal real soon. Popcorn for a snack-the old fashion kernals are cheap! cut a roll of bounty in half (use a coupon to buy), add 4 T of baby oil, 2 T of shampoo, 4 c water into a sealed container like a tupperware bowl - put the bounty in there and let the water absorb, when absorbed pull out the cardboard in the middle-these are very cheap wipes. These can help use less toilet tissue. I won't recommend where you shop but I will make a recommendation on how. By large amounts of things that you can make multiple meals with. Larger amounts of something are usually cheaper than small amounts (not always). For example: I am going to buy a family pack of chicken breasts and cook most of them in a slow cooker. This meat I can fry and season with fajita seasoning for fajitas, mix with salad dressing for chicken salad, add to rice with some sauce and pineapple bits for sweet and sour chicken. I am going to keep one breast and grill it for barbecue chicken. Be creative, make lists of foods you like and see if you can't buy and cook for several dishes. And read some of the archived articles here on ThriftyFun, they are really good references. I feed a family of 4 on 50$ a week and sometime's it's less. I buy what's on sale and buy stock up's when I can combine a coupon w/ a sale or it's just a great price(ketchup,mayo cereal ect. )and also buy store brand's on sale.This way I don't pay full price for anything.I buy whatever fresh vegtables or fruit is in season and in winter buy frozen which is as good as fresh. How can you stretch your food budget, if you have only 35 dollars a week for the food budget? This has to also include laundry soap, dish soap, and toilet paper. Lady I feel your grocery bill pains, I live in Alaska, and just going to purchase a few items from the store will cost me $50.00 or more. So I have been researching how to lower my grocery bill lately and found something very valuable. I hope this helps you, too. I read in a magazine that a woman purchased $250.00 worth of groceries for $0.62 and I read about how she did it. Read this article, you can do it, I did it, and once I got organized at couponmom.com it made it much easier to save. Dry beans, oatmeal, grits, and potatoes. Stay away from the prepared boxed stuff and get back to the basics of cooking items in their natural form. If you do not know how, ask around I'm sure there is a neighbor that would be glad to show you how or go to a recipe website and look at receipts. I'm traveling quiet a bit right now with my husband and am meeting new people daily that are experiencing hardship also. I just showed a young mom and her husband how to cook beans. They thought it was hard and were amazed at how easy it is. A pot of beans can be fixed in a lot of different of ways. Add rice which is another cheap staple with the corn bread as another poster mentioned and you have a meal of kings. Mash beans and add to the fixings for chili and you can use next to no hamburger and the taste is not changed. Mash beans and add taco seasonings (there should be a recipe here somewhere) and you have the making for a good dip or a sandwich spread or taco cups (use cornbread mix in a muffin tin and leave an indention for beans). Definitely try for food stamps and visit the local food banks Jenny Jo listed for your area. I am on a "very limited" income and receive $72.00 a month in food stamps. What I do is visit the food bank once a month for staples such as flour, sugar, and canned items and use the food stamps for fresh items such as milk, cheese, eggs, fresh fruits and veggies, and orange juice. Also, when you make meals make extra and freeze that extra in individual containers. Keep an eye on Walgreen's weekly fliers. Once a month they offer their "Big Roll" of toilet paper for 50 cents each, limit four. For me that lasts a month for a total of $2.00 a month. They also often have great sales on dish soap, a 16 ounce bottle for under one dollar. There are also many store type brands of laundry soap for about $5.00 for 75 loads. Another good resource is Angel Food Ministries (web address http://angelfoodminitries.com). For $35-60 you can buy one or two big boxes of food that for me is enough to feed me for a month or more. They have sites all over the country so I'm sure there's one in your area. Plus if you begin your shopping at the $1 store it'll save you a lot of money. I always go from the $1 store, to Dollar General, and then to Wal-Mart or the grocery store. Whenever you have leftovers, put them into individual size containers and freeze them. Later you can combine different containers to make a meal. Making big pots of soup is another way to stretch a food dollar. I make huge pots and then put them into individual containers and freeze. Casseroles is another method. If you're cooking for one, go ahead and make a larger size casserole, then put it into single serving size containers and freeze. And casseroles can be made from just about any combination of things your imagination can come up with. They are also a great use of leftovers. I can get a 6 roll pack of toilet rolls for $2. Look for the cheapest you can. Regarding food, someone mentioned cereal. Here in Australia boxed cereal is an astronomical price, not budget food at all, but oatmeal for porridge is cheap, and filling and healthy. Eggs, the cheapest cuts of meat, even the toughest cuts will improve with long, slow cooking in stews and casseroles. Pasta is cheap and filling. Only buy fruits in season. When I was a poor single mom at one stage in the fruits I could only afford apples and oranges, the then cheapest fruit available. The kids did moan about no bananas, grapes, etc., but I let them moan, at least they were getting fruit. That goes for veggies, too. If carrots are the cheapest, buy carrots. The young carrots are delicious raw and others can be used in stews and soups. Potatoes can be used in many ways, and are filling and delicious. If the kids beg for fries, no trip to the fast food outlet, chip the potatoes and fry them yourself. Frequent the stores like Aldi's, and Save-A-Lot. I too am on a limited grocery plan and have been for many years. One item that has helped us is TVP, textured vegetable protein. It comes in large crumbles or small. I use it in place of ground meat, and my family cannot tell the difference. I have also learned to do with less. I purchase concentrated no-name laundry detergent and only use 2 tablespoons of detergent when I do laundry. I only wash on cold water. This one fact saves about $2 a week in heating costs. That money can be added to the grocery budget. I also hang clothes up to dry and save on gas usage. Buy a box of non-fat dry milk. I use to buy 1 gallon of regular fat milk and pour half into another container, mix in a half a cup powdered milk and then fill to the top with water. My kids liked this milk over skim milk any day. Plus for the cost of 1 gallon of milk and a few cents I had two gallons. Another area to purchase is pasta and dry beans. Dry beans are only a few cents compared to canned. Pasta is cheapest when purchased by itself. Stay away from the mixes, they are too expensive and are devoid of nutrients. Have you tried, letting family and friends know how tight it is, I am sure they would help when they can. My husband and I can only purchase groceries every 2 months now spending only $50 at a time. I told my friends at church how tight it is and many people, even people I don't know have given us staples and even expensive cuts of meats that I would never be able to purchase. I looked over your local Walmart ad to get some prices. As someone else said, laundry and dish soap are not a weekly thing (maybe toilet paper is, depending on how you buy it), so future purchases will have more food items. Here's how I spent a little over $35, based on ad prices and my own Walmart shopping experience. I go to several stores to get the best prices, so I could probably drop the cost of this a few dollars more. This list assumes that you have some general staples in the house, too, like seasonings. I usually have boiled eggs in the shell and fresh fruit, ready to eat. I also cook beef liver with onions in E.V. oil. I use can salmon. I cook and then add onions, pickle relish, shredded lettuce, and shredded cheese. I buy institutional size ravioli, add soy sauce, 1/2 cup Dr. Pepper and warm in crock pot. Groceries are so expensive. I have 3 kids one with a milk allergy so, we buy 2 different types of milk, and basically I make 2 meals if anything has milk in it. My kids are ages 7, 5, and 1. Any tips on easy meals that can be made into leftovers?